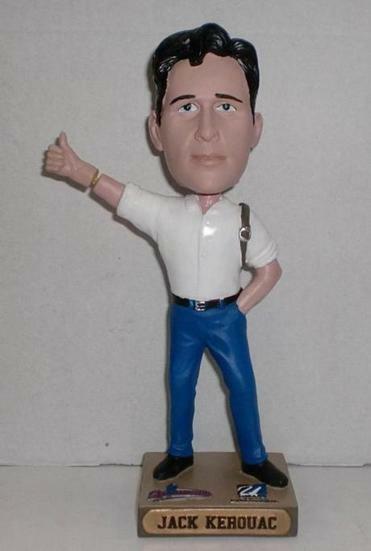 We got an early look at the new Jack Kerouac bobblehead doll that the Lowell Spinners will hand out in August to celebrate the movie “On the Road,” the film adaptation of the Kerouac classic starring Garrett Hedlund, Sam Riley, Kristen Stewart, and Kirsten Dunst . The Spinners passed out their first Kerouac bobblehead in 2003. It featured the Lowell-bred writer happily bobbling with a pen and a notebook in hand. The new toy has the Beat Generation hero hitching a ride and toting a little backpack. The doll will be handed out to the first 1,000 fans at the Aug. 7 game in partnership with the UMass-Lowell English department. Fans who can’t get to the game can buy the doll online starting that that afternoon for $20. Half of the money will go to the Kerouac Scholarship Fund. The Spinners say they’ll make another Kerouac bobblehead for the 2013 season that will feature the writer in his Lowell High School football uniform.